Mobile homes have less upfront costs over stick-built houses, and at about 1,100 square feet for a single-wide, living space is similar to a small two-bedroom house or relatively large apartment. A double-wide has about 1,700 square feet, making it as big as many houses. Property taxes and insurance also cost less for a mobile home than for a stick-built house. One of the major advantages of manufactured home ownership over apartment renting is the chance to build equity. While renters pay rent each month with no return (other than a place to live), mobile home owners make mortgage payments and build equity, which they can borrow against in the future. In addition, a mobile home owner can sell her property in order to fund a move or to capitalize on a rise in the market value, while renters stand to gain very little to nothing if housing prices increase. Mobile homes are cheaper than a house to maintain in several ways. Fixing a mobile home roof costs less than fixing a traditional shingled roof, and adding a new roof over the top of the old one costs less than putting a new roof on a stick-built house. The furnace can be more reasonably priced because it heats a smaller living space and one floor only. Your heating bills will be lower because of the more compact space, particularly if you do some winterizing. 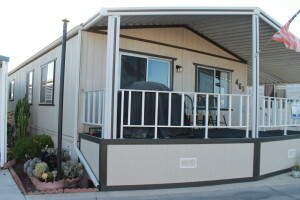 Another major difference between buying a mobile home and renting an apartment is the degree of control over the space. A rental agreement may not allow tenants to paint walls, install new fixtures or make other improvements. On the other hand, a mobile home owner has complete control over making improvements and decorating the home to express a personal style. While a mobile home owner’s improvements might increase the value of the home, a renter’s alterations might result in the landlord withholding a portion of the tenant’s security deposit.